The 6th EFC Satellite Meeting will be held at the Pullman Hotel Brussels Centre Midi on December 1st 2018. The Satellite Meeting will be preceded by the EFC Training the Trainers course held in the morning. 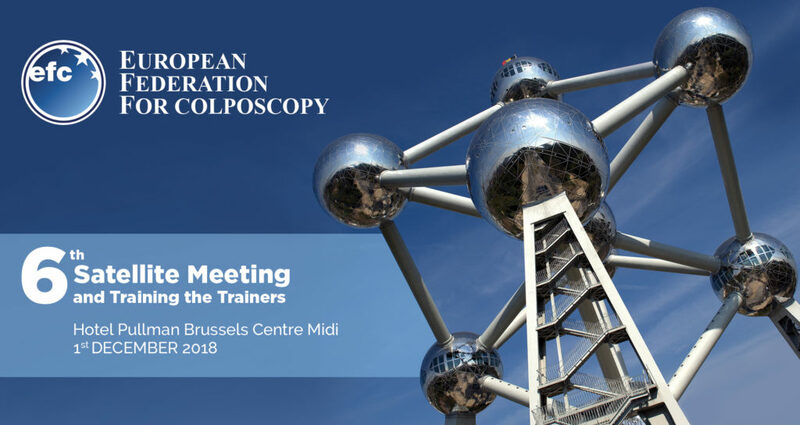 These meetings are the powerhouse for driving the EFC’s agenda which aims to improve the quality of colposcopy throughout Europe. To date, the EFC has had a good track record in developing European treatment and performance standards (e.g. Petry et al Eur J Obstet Gynecol Rep Bio 2018, 224, 137-141). In addition, the results of a systematic analysis concerning the prognostic value of involvement of excision margins compared with post-treatment HPV testing have recently been published (Arbyn et al, Lancet Oncology 2017, 18, 1553-1770). These results illustrate the potential of the EFC to influence practise and we want the Satellite meeting to build on that success. Therefore, the focus of this meeting is to develop a constructive plan of action. To do this we need the active involvement of all our member societies. Also, this is the last Satellite meeting before the Triennial Congress in Rome where many important decisions will be made so it provides a useful chance to discuss them. Make a date in your diary! 9:30 – 10:00 Optimizing training: What should be the ideal training nowadays? 10:00 – 10:30 Who can be a trainer and what the role is? 15:30 – 16:00 What areas warrant evaluation? We negotiated a discounted rate for participants at the Pullman Brussels Centre Midi Hotel, where the Meeting will take place. To benefit from the rates, book your accommodation by clicking on the button below. If you’d like to attend the EUROGIN Congress in Lisbon as well, don’t worry! There are several flights per day from Brussels to Lisbon via Brussels Airlines, Tap Air and Ryanair, that will allow you to be in the Portuguese Capital in under three hours. The best option would be to take the flight on Saturday December 1st at 19:15 via Tap Air Portugal that lands in Lisbon at 21:00. Please don’t hesitate to contact us if you need further information.